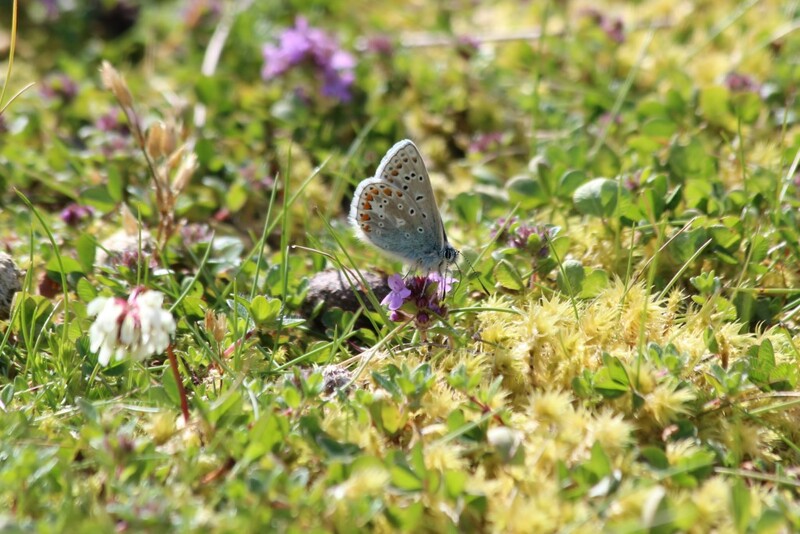 The warmer days of July saw the emergence of several butterfly species across both Colonsay and Oronsay. Flashes of blue can now be seen in the sand dunes with these being the beautiful common blue butterfly, whilst if you are lucky you may also spot a dark green fritillary fluttering hurriedly by. The meadows are now awash with both meadow browns and ringlets, which although not as stunning are still a delight to see. Additionally, strong southerly winds around the 7th/8th of July brought one or two painted ladies to the islands. The painted lady is a species of butterfly which originates from North Africa and is a migrant to the UK. Unfortunately they cannot survive the winter and therefore any individuals seen early in the summer months are definitely migrants from the South. Some years these butterflies can occur in extremely large numbers in the UK and if they are here early enough may breed, with this generation emerging in August. 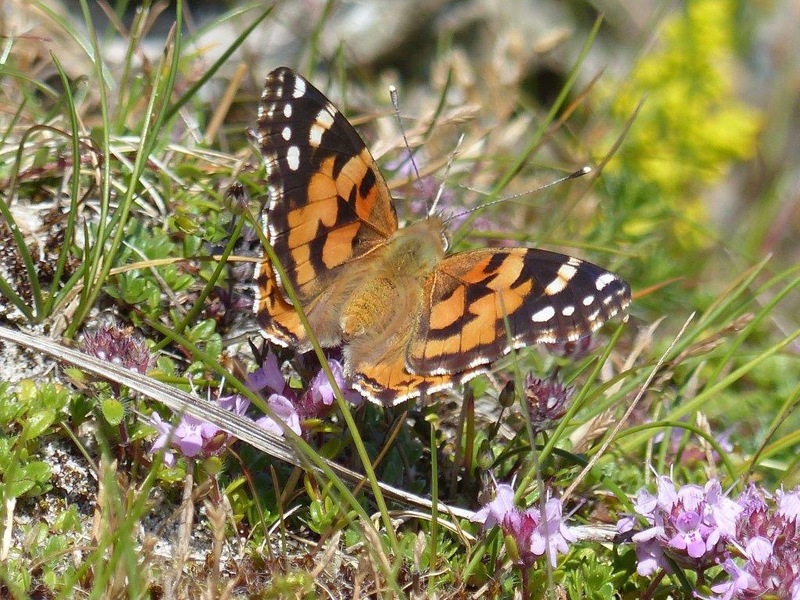 Interestingly, the painted lady is the only species of butterfly to have been recorded in Iceland. 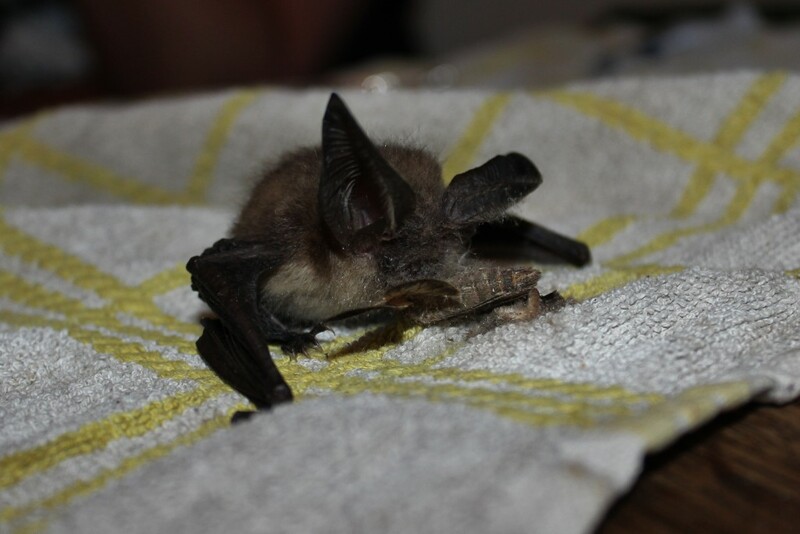 This month we had a call from Jane Rose on Colonsay who had found a brown long-eared bat looking slightly under the weather. The brown long-eared bat has previously been recorded on Colonsay and is found throughout the UK with a population totalling 245,000. It is extremely distinctive, having long ears which are nearly the same length as its body, which it uses for echolocation to catch its prey. Moths are the main prey item, along with small insects which are gleaned from the surface of vegetation as it hunts along woodland edges. Due to the nature of its hunting technique this species has relatively good eyesight (at least for a bat anyway). Seeing this amazing mammal up close was a real treat for us all. During July there has been a steady increase in sightings of juvenile birds, including shelduck, raven, eider, stonechat, willow warbler, twite, linnet, greenfinch, chough, wheatear, common gull and herring gull all being seen frequently. July has also seen the start of migration with passage waders now being spotted along the shores of the islands. These have included a flock of 15 black-tailed godwits and 7 golden plover on the 12th. A flock of 15 dunlin present on the 13th, along with a single greenshank and most recently a flock of 40 sanderling on the 28th. All of these species are now migrating back to their wintering grounds and are simply stopping off on the islands to fuel up before setting back off on their journeys. 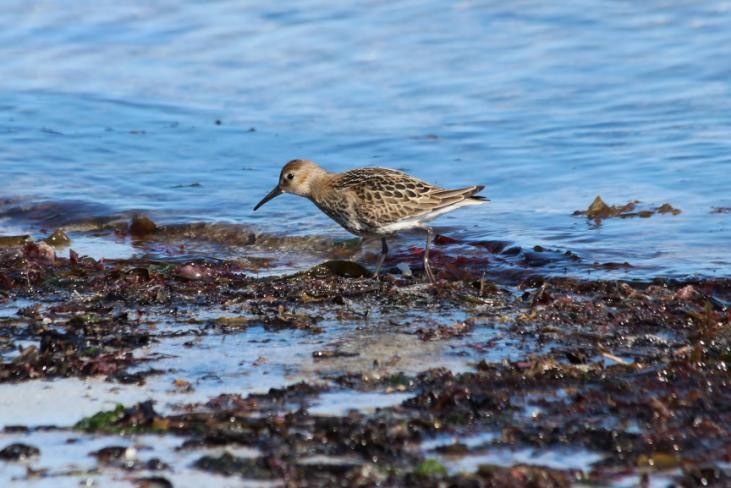 Migration will start to get into full flow over the coming months and with passage waders already being seen it is worth keeping an eye out for species such as whimbrel, greenshank, sanderling and dunlin. Warm weather should see more meadow browns, small tortoiseshell, peacocks and dark green fritillaries on the wing to add a splash of colour to late summer. Photos: Painted lady (Mike Peacock), Common Blue (Luke Wake), Brown Long-Eared Bat (Luke Wake). During the month of August the islands were blessed with some prolonged periods of settled and warm weather. This settled weather saw an increase in insects on the wing and there were certainly some beautiful and interesting sights to be seen. 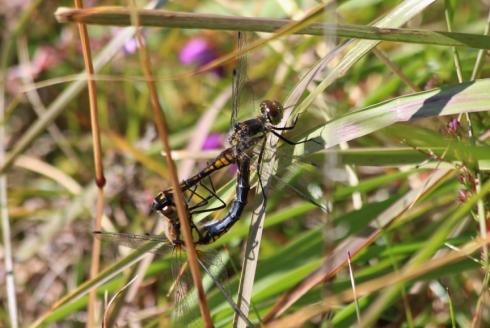 Around the boggy parts of the islands dragonflies could be seen zooming around in search of food, defending territories and seeking mating opportunities. The black darter was one of the species present. 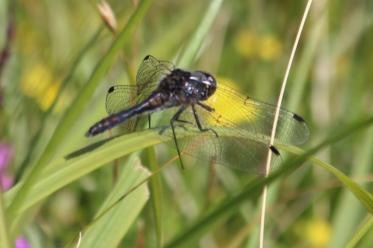 This species is Britain’s smallest resident dragonfly at around 30mm in length. They inhabit heathland/moorland and require shallow acidic pools in order to breed, they really are a truly magnificent sight as they dart around in search of food on a hot summer’s day. Colletes succinctus is a species of bee which inhabits coastal dune systems and one which you will certainly notice on a warm day. This species is a solitary mining bee, which although having no workers or social system it does live in aggregations which total many thousands of individuals. They require warm weather in order to be active and create an extremely impressive sound and spectacular sight as they buzz around the dunes. 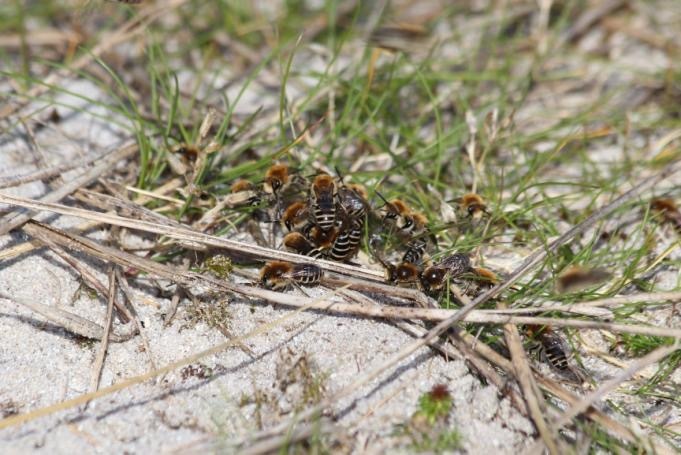 Moreover, if you have been lucky enough you may have witnessed a ball of these bees tumbling across the sand. This spectacle is a mating ball, whereby many males surround a single female with one male eventually winning the battle. 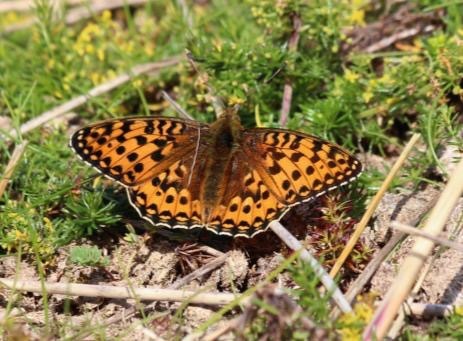 The stunning dark green fritillary has also been livening up the coastal dunes during August. This large butterfly is a very fast and strong flyer and therefore you often only catch a glimpse of this beautiful beast fluttering past. However, if you follow one for long enough you may just get a chance to see it in all of its beauty. This butterfly is the most widespread of the fritillary’s in the British Isles and its larval food plant is common dog violet. 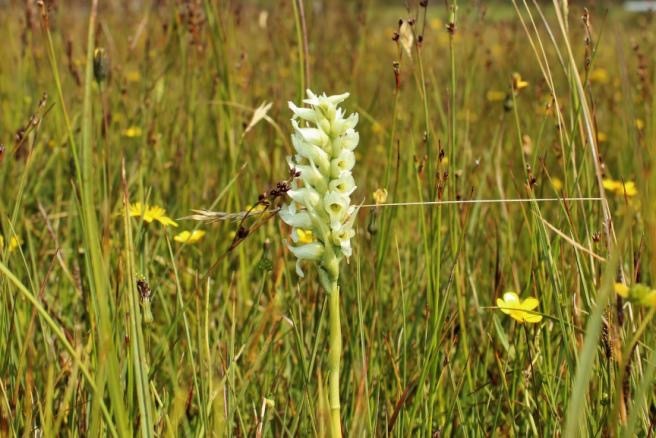 This year has again been another good year for Irish lady’s-tresses on Oronsay, with 198 flowering spikes being found in late August. Late August has seen an increase in wading birds present across the islands. There have been steady occurrences of dunlin, sanderling and ringed plover on the beaches, along with black-tailed and bar-tailed godwits also being seen, whilst 3 knot were seen on the strand on the 27th. Additionally, hen harriers have been seen regularly on Oronsay and this year’s young buzzard has been flying about begging its parents for food. Furthermore, the finch flocks seen across Oronsay are building into their hundreds, with these flocks predominantly made up of twite, linnet and greenfinch. During September migration will be fully underway and therefore we will be seeing the last of our summer breeders such as swallows departing the islands. More waders will be passing through, so I would expect a steady trickle of dunlin, sanderling, ringed plover and whimbrel. However, during stormy periods many migrants can be blown off track and literally anything can turn up, so keep your ears clear and your eyes peeled.